Burn has always existed in Modern in some capacity. However, it never gets any respect or discussion until there’s a major metagame shift or new cards. This is unfortunate for players of the archetype and their opponents. The former often receive derision for playing the kiddie deck, and the later don’t realize how vulnerable they actually are until too late. I aim to help correct this problem today. It might be because I live in Denver, a notoriously red-friendly city, but I’m always shocked when players don’t prepare for Burn. The deck is a certified predator thanks to most Modern decks Bolting themselves at least once with fetch and shock lands. Manabases have become less damaging since the enemy-colored fastlands were printed, and this made Burn appear less potent. However, the data usually disagrees. Burn is consistently a major player in the metagame. It’s time to stop pretending that Burn’s only viable when it gets new cards. It’s always good, and players must be ready. The only real question is what form it will take. I think that lots of players, especially those that make Magic content, sometimes just forget that Burn exists. I don’t think they actually discount the deck, but until something specifically happens, they just don’t talk about the deck. Shortly after Monastery Swiftspear was printed, there was a huge spike in articles, especially after a good showing at PT Fate Reforged. Then, silence. A few videos here and there, but not much discussion of the deck itself. If it was discussed at all, it was as part of sideboarding plans for other decks. Even then the strategy always comes down to answer a few burn spells, race, and pray. Once Collective Brutality was printed, it got worse. Players assumed that Brutality was the end of Burn. Which makes sense: Brutality is very efficient at answering everything Burn does on the cheap, and definitely remains a potent answer. However, Burn just motored through. In 2017, Burn represented 6% of the metagame. In 2018, it was still at 6%. Despite this consistency and resiliency, most competitive players seem to think of Burn as just a metagame choice. Maybe the enduring stigma of being an “autopilot deck for n00bs” remains strong, but Burn just doesn’t get the respect it deserves. It’s not just Burn’s history or individual achievements that demand respect. Burn is a major predator in Modern. Whenever new decks appear, there’s always that lingering question of the Burn matchup that they have to answer. When Death’s Shadow emerged, players assumed that Burn would just crush the deck. However, the Shadow players were aware of the vulnerability, and adjusted their gameplan. Every other matchup was straightforwardly played for a deck like Grixis Death’s Shadow, but Burn required actual substantial gameplay adjustments. That’s significant. Weird, slow, and/or specifically interactive decks tend to have very poor matchups against Burn. Much was made of Humans’ matchup against Storm in 2017, but Burn had a similarly strong matchup. Arguably, Burn had the better maindeck card against anything Storm or any combo could do in the form of Eidolon of the Great Revel, and to a lesser extent Searing Blaze. Tron similarly struggles: Wurmcoil Engine is a fantastic threat, but Burn has Skullcrack. Everything else is mediocre against Burn’s attack or is very slow. There’s a reason current Tron lists sideboard heavily against Burn. A more extreme example is Lantern Control. Burn was the nightmare matchup because Ensnaring Bridge was minimally effective and Lantern could never allow Burn to draw a single spell. Everything but the creatures gets thrown at the face, so going long game 1, Burn was going to find enough fire. The printing of Inventors’ Fair gave Lantern players some hope, but it was still terrible. I credit the prevalence of Burn for keeping Lantern from ever gaining traction. Even if a given deck isn’t specifically terrible against Burn, everyone is vulnerable. Individual matchups aren’t what makes Burn a good deck, or even what it’s actually preying on. Burn targets Modern as a whole. The fact that the manabase is painful certainly helps, but that’s not something contemporary Burn can rely on. Instead, Burn thrives because it takes advantage of how everyone else sees Modern. There is a perception that Modern is entirely linear and uninteractive. This is false; even a cursory look through Modern decklists show that some combination of creature removal, counterspells, and targeted discard is in every deck. A more accurate description is that Modern cycles between periods of high and low quantity of interaction. In 2017 Grixis Death’s Shadow dominated early, then Jeskai Tempo rose. Both were replaced by Humans in 2018, a year that saw UW Control, Hollow One, Mardu Pyromancer, Dredge, Spirits, and UR Phoenix become the decks to beat. More interactive decks followed by less and back again. Through it all, Burn held steady in the upper tiers because it naturally responds in opposition to the trend. When interaction is high, Burn goes less interactive and faster to slip past defenses. When UW Control is popular, I see Burn maxing out on one-mana spells to overwhelm counters. There’s also the option to completely ignore defenses with Exquisite Firecraft. If the rest of the format is getting more aggro-oriented, Burn responds with more Grim Lavamancers and Searing Bloods. It can go as extreme as hiding behind Ensnaring Bridge and chucking burn until the opponent dies. Players may think of Burn as just a metagame deck, but the truth is that Burn regularly pushes against metagame trends. This doesn’t mean that Burn polices Modern. If Twin didn’t, I don’t think anything actually can. Instead, I argue that Burn is and has always been a pillar of the format. It’s a deck that every other deck must take into account and always does well. The key is that Burn is the most focused deck in Modern. It doesn’t mess around with enablers, cantrips, or air. Every single nonland card gets pointed at the opponent’s face. This gives it considerable game in any situation, and ensures it is always relevant. This makes it all the more baffling that players just don’t play well against Burn. In my experience, most think of Burn as just an aggro deck and that stalling their offense and gaining back a few points of life is enough. This attitude forgets first of all, that Burn has faced this attitude since time immemorial and found ways to win. Secondly, they’re forgetting Burn can just keep flinging cardboard at their face after the lifegain spell. Burn almost always has inevitability as a result. Thus players need to either preempt Burn by winning first or shut down Burn completely. The former is done with racing, and is where lifegain spells like Blessed Alliance are good. Decks that don’t effectively race need to actually shut Burn down and steal inevitability, either with continuous lifegain or actual, effective hate. There are few Modern playable cards (other than being Soul Sisters) outside Kor Firewalker for the former, though Lantern tried Sun Droplet. The better option is to just beat Burn with Chalice of the Void, Witchbane Orb, and Leyline of Sanctity. Burn’s cheapness and linearity are its greatest strength and weakness and I’m surprised these aspects don’t get attacked more. Burn is efficient and focused enough that if its opponents stumble at all, regardless of how the matchup *should* go, it will win. This doesn’t mean that players need to go all out with maindeck hate or sideboarding like Tron. Instead, it’s time to give Burn its due, just like the Shadow players did, and figure out how to play against it. Burn’s greatest strength so far has been that opponents don’t really understand it, and that needs to change. This is of supreme importance now because Burn got some new toys in Ravnica Allegiance and it’s the New Latest Thing. 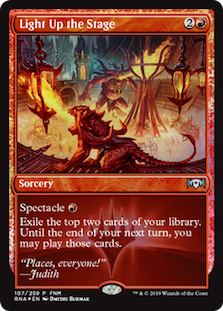 The spectacle mechanic, and Skewer the Critics and Light Up the Stage specifically, are tailor-made for Burn decks and are making their way into Modern. It’s a natural fit. Rift Bolt has long been a staple, and Skewer is that with a different restriction. It’s a more restrictive restriction, but in a deck like Burn, damaging the opponent isn’t that hard. This is also made easier thanks to Stage. Functionally a one-mana Divination, Stage is a very good deal, especially in a deck that is entirely cheap spells. Playing more spells than the opponent is a time-honored route to victory. It’s been a while since Burn got anything substantial, so at minimum, it’s a nice treat for Burn stalwarts. I haven’t been impressed by the new cards. They’re fine, and if they encourage new players to play Modern, then I hope they maintain a presence in Burn. However, in my experience so far, they haven’t been necessary and are sometimes actively harmful. Last week I mentioned that Lavinia has been surprisingly good against Burn because of Skewer and Stage. Burn may only cast them for one mana, but they still have a CMC of 3, and Stage decks are cutting a land. I’ve also won a number of games against Burn recently thanks to them having no way to spectacle-cast Skewer or Stage. Were those stranded cards Boros Charms or Skullcracks, I would have died. Instead, I had the time to put together an offense and win. I’ve also never had a game where Stage actually won my opponent the game. Chaining Stages together did produce an impressive amount of reach, but when I died, my opponents still had plenty in hand to kill me. They didn’t need the Stage. In attrition matchups, that may change, but so far that hasn’t happened. I’ve witnessed a lot of games against Jund and UW where Stage didn’t change the outcome. Games that normal Burn won would have won were won, and vise-versa. How does this deck beat Chalice of the Void or Leyline of Sanctity? I know that neither sees much play right now, but that is easily fixable. Naya and Boros Burn can struggle against those cards, and they play answers out of the sideboard. I don’t think there’s any out to Leyline for Rakdos except for creature beatdown. These new Burn decks are trying to ignore the opponent entirely, which is a fine strategy as long as Modern continues to not be ready for Burn. This list isn’t as fast or streamlined as Rakdos, but it is ready for players that pay attention to it. There are answers for the typical hate that fit into the overall strategy and provide outs to anything. If players finally wake up to Burn, this type of reliability will be necessary. Skewer and Stage have not suddenly made Burn a real deck. It always was one, even if players weren’t paying attention. All they’ve done is focus attention, long overdue, onto the deck. Right now, they’re pushing Burn away from the resilience and adaptability that made it a pillar of Modern for so long, but I think the archetype is sure to cycle back to its roots. Burn has always been. Burn will always be. Been playing burn for about a year, and last weekend I took the deck to a six round swiss event going 4-2 while missing the cut. I liked Skewer in general, but I did find myself in a game where I ended up with three in hand simultaneously. That’s pretty awkward, but I also realize the odds of that happening are low, and I did get some high-powered turns unleashing three burn spells early on to put an opponent on the back foot. It is risk/reward, but not as much of a gamble as some other deckbuilding options in the format. I’d argue it becomes last in, first out among bolts when sideboarding. Light Up the Stage has held zero appeal to me. It is the source of constant debates with other burn players, but my stance is that any time it gives me one burn spell I would have preferred LUTS just be a burn spell to fire off that turn. If it gives me two, odds are I would have preferred drawing one instead and the second the next turn, because I am often strapped for mana as such that I would not cast bolt, then spectacle LUTS, then get two more spells I can use that turn. Some people think it is a source of card advantage or an enabler, but burn is just…burn. It’s greatest tool is pure efficiency, and trying to circumvent its weakness reduces that efficiency. Side note, while I wouldn’t call it a police deck, it is interesting how it has game against so many decks people hate/call for bans in infect, tron, storm, and lantern.